Each January, we will mail your 1099-K. You should receive it by the end of the month. Your 1099-K will also be posted to Compass, our online reporting tool. What do I do with the 1099-K? As with all tax matters, you should consult your tax advisor to determine the best approach to complete your income tax returns. Based on the latest available knowledge, the Form 1120 and Form 1040 Schedule C do not have any specific line items to report the amounts from your 1099-K. However, you may need to report sales from credit and debit card transactions as part of the gross sales on your tax return. To make tax preparation easier, we provide an annual Activity Summary report that includes gross sales, credits, chargebacks and fees. The Activity Summary Report will be posted to Compass each February. We recommend that you provide both the 1099-K and Activity Summary report to your tax advisor or accountant to help them properly complete your tax return. Could you help me understand what’s on my 1099-K? Please see the sample 1099-K below, which explains the different elements on your 1099-K and how it pertains to your merchant processing with Clearent. What transactions are included on Form 1099-K? We are required to report “payment card transactions,” which have a precise definition in the tax code. The definition includes all credit cards, debit cards and stored-value cards (including gift cards). Form 1099-K includes sales data for the full calendar year, plus the subtotal for each month of that year. Specifically, we must report gross sales (not adjusting for credits or returns) by the transaction date (not the settle date). The IRS rules also specify who needs to report payment card transactions. 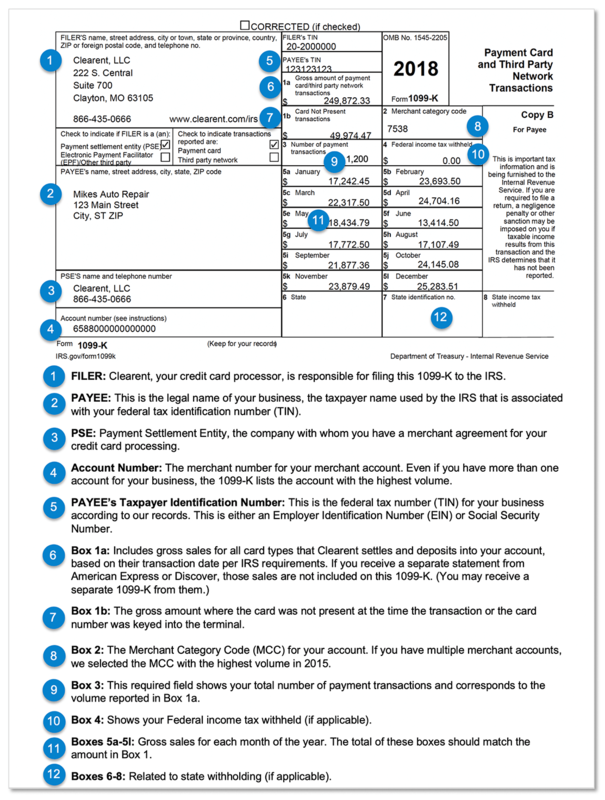 As a general rule, the acquirer or processor that does the settlement of the transactions – meaning the company that puts the deposit into the merchant’s account – is required to report such transactions on Form 1099-K. As a result, Clearent may not report transactions for American Express or Discover accounts where you get a monthly statement directly from Discover, Wright Express or Voyager. Why don’t the sales on my 1099-K match my monthly statements? If you have more than one merchant account with the same Taxpayer Identification Number (TIN), your 1099-K includes sales from all of the accounts. The IRS requires us to report gross sales on the 1099-K. Your monthly statement typically reports both gross and net sales, so please make sure you compare the same amounts. 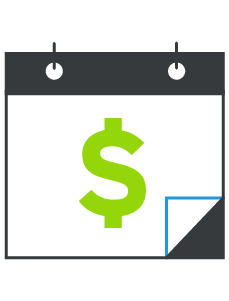 The IRS requires us to report sales by the transaction date on the 1099-K, whereas your monthly statement reports sales by settlement date to align with the deposits in your account. However, you can export data by transaction date on Merchant Home to compare it to your 1099-K. The 1099-K may not include all card types because the IRS requires us to report only card types that we settle (i.e., deposit into your account). If you get a separate statement from American Express or Discover, those sales may be included on your Clearent statement, but not on your Clearent 1099-K.
Why do you report gross sales on the 1099-K? The IRS requires that we report gross sales on the 1099-K. Your business may be able to benefit from potential deductions such as credits (returns), chargebacks and fees when you file your tax return. Will I receive a separate 1099-K for each merchant account? The IRS requires a separate 1099-K for each business that has a unique federal TIN. If your business has more than one merchant account, the 1099-K includes sales for all accounts with the same TIN. What is the Account Number on my 1099-K? The Account Number is the Merchant Number for your merchant account and is included to assist with your record keeping. The IRS is focused on the TIN from your tax return – not your account number. If you have more than one merchant account with the same TIN, the 1099-K includes the merchant number with the highest sales volume. How do I know which accounts are included on my 1099-K? Your 1099-K includes activity from all merchant accounts that share the same TIN, per IRS requirements. The Activity Summary report lists each merchant account associated with your TIN. A Merchant Category Code (MCC) is a four-digit number used by the card associations, such as Visa and MasterCard, to classify a business based on the types of goods and services it provides. How did you pick the MCC on my 1099-K? When we first set up your merchant account, we selected the MCC that best represented your business based on card association guidelines. If your business has more than one merchant account, the 1099-K includes the MCC for the account with the highest sales volume. My account is closed. Why did you send me a 1099-K? The IRS requires us to report all of your activity for the calendar year, even if you closed your account during that year. My TIN is wrong. How do I fix it? We used the legal name and TIN that we had on file for your business. If it is incorrect, please help us correct it for you for next year. You can make changes on the Account Settings page in Merchant Home, or you can contact our Customer Support team.